WAILUKU » Several years ago, Melissa Rupert suddenly found herself with no job, home or car, and raising an adolescent son. "I lost nearly everything at one point and had hit financial bottom," Rupert said. But Rupert, 56, had an idea that has blossomed into a successful enterprise. 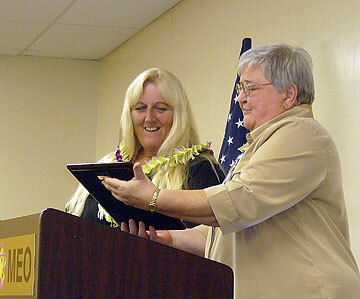 Her business "Flowers By Melissa" recently received the 2006 Annual Hand-up Entrepreneurial Award. The award is given by Maui Economic Opportunity's Business Development Corp. to a Maui venture that embodies the entrepreneurial spirit. "Melissa Rupert's experience is an inspiration to all who are in need of a hand-up, for her determination, can do attitude and success in her chosen profession," said Susie Thieman, chief executive officer of the Business Development Corp.
Rupert's floral arrangements have graced weddings and other special occasions at some of Maui's most prestigious resorts, including the Ritz-Carlton Kapalua Grand Wailea. Rupert specializes in bridal bouquets and custom leis and said her enterprise has reached $100,000 in annual revenues. Things began to look up while living at a homeless shelter, where she took a class organized by Maui Economic Opportunity, Inc., on how to start a business, a step she had considered but was afraid of trying. "I was scared of success. I was scared of failure. I was paralyzed," she said. Rupert said the business class helped to build her confidence. She decided she wanted to start a floral business and was advised to get a job in a flower shop to find out if she really liked the work. Maui Economic Opportunity instructors also advised her to interview people who owned flower businesses. Rupert said she worked for two floral businesses and eventually obtained a grant from the state Department of Vocational Rehabilitation to attend the Southern California School of Floral Design for three months. State vocation rehabilitation also paid for a computer, plus software, and a special flower refrigerator, and she also graduated from business planning classes offered by Maui Economic Opportunity's Business Development Corp.
Rupert said she believes so much in the classes offered by the Business Development Corp. that she encouraged her son Justin to enroll in them. He recently graduated from the Corp.'s business planning classes and started his own underground utility detection business, Pacific Underground Detection. Rupert, who hopes to expand her business in January to provide wedding planning, said she feels fortunate to be working in a field she enjoys. "I have always loved flowers and feel blessed that I am able to make a good living," she said. "I never imagined I'd be so successful. I'm still in shock."